Many know him as Dwight Schrute from The Office, but Rainn Wilson is much more. In 2008, along with Joshua Homnick and Devon Gundry​, he founded SoulPancake – a media company that “seeks to provide platforms to explore “big think” topics such as spirituality, creativity, religion, arts, and philosophy”. From Metaphysical Milkshake​ to Kid President​ videos, this rapidly growing company is all about getting you to think. In this video, A Wall of Words! SoulPancake asked people on the street to share their favorite quotes on a wall of post-it notes. Contrary to the notion that quotes are inferior to original ideas, I believe that they can be just as powerful. Sometimes someone has simply put into words what you’ve always felt, but had the inability to articulate it with words. Quotes help us process experiences (good and bad), reflect upon ourselves and the world around us, and guide us towards our dreams. Find out more at www.danielhkwan.com! What’s your favorite quote? Read the rest at danielhkwan.com! ​But there will be a time in your life when something special is going right. When everything is falling into place, and depending on your mindset and how this was achieved, this may last forever. However, it has become apparent to be that this may bring about a certain degree of guilt from some of us. I’m certainly no stranger to this. We never forget the times when we’ve lost control, shouted at those we love, or neglected a hug we wish we hadn’t. They haunt us like shadows and sometimes this makes us feel strange, guilty, and undeserving of the praise we receive. But never forget that we are not perfect and these moments of guilt are good reminders of what we should try to avoid in the future. Everybody is worthy of achievement if they were gained through morally right and fair means. So don’t let them sully hard-fought moments of greatness. Instead, use them to make these moments all the more special. We may have been mistaken in the past, but never doubt what you’ve achieved in the present. To simply put it, the weight of mistakes shouldn’t hold you down. Learning from them provides us with the potential for personal growth. Mistakes are the stepping stones to learning! As some of you may know, I recently got into photography as an attempt to broaden my skill set for archaeological field work. It’s become a pretty fun hobby! I decided to share snapshots from some of my adventures abroad HERE, on the photography section of my new website! Forget the bad. Focus on the good. We all encounter out fair share of drama. One of the effects of my own search for self-reliance and happiness was the loss of a few friends. We simply grew apart and went down separate paths. Sometimes burned bridges can’t be mended and that’s the reality of living our own lives and growing up. All we can do is appreciate that we once shared a phase in our lives – appreciate the influence they’ve had on who we were in the present. Paraphrasing Elizabeth Foley, with the drama and frustration they might come with, in times like these our eyes are also opened to the presence of a select few true friends who we can grow separately from without growing apart. I’ve tried very hard to pursue what I am passionate about — archaeology, writing, martial arts, and personal happiness. So far, my hard work has paid off tenfold. I’m not an exceptional human being. Physiologically and neurologically, nothing makes me very different from anyone else. My mental approach to life is what’s different. That’s for damned sure. I’ve never stopped and I don’t intend on it. If I remain accountable for all of my failures and pain, then my successes are my own. I’m leaving my mark on this world. I’ve moved! Switching from WordPress to Squarespace. After much deliberation and a little bit of hard work, I’ve very excited to announce that I’ve moved this blog to http://danielhkwan.com/! Although WordPress has been nothing but fantastic, I love the template and stylistic flexibility (for someone who has very little training or knowledge of CSS or HTML) of Squarespace. It’s allowed me to create the personal website I’ve always wanted. As an added bonus, I was able to import all of my WordPress content! This way, I’m now able to actively share my photography, blog, social networking, and bucket list with you…all on one platform. I hope you’ll continue to read my blog during the new stage of this incredible web-journey! Bucket lists – Have the courage to make your dreams a reality and share them with the world! For the regular reader of this blog, it is very clear that the concept of the “bucket list” is very important to me. Developing a list of things I want to do before I “kick the bucket” has become one of the most worthwhile projects that I’ve undertaken. I’ve learned so much about myself, how far I can push myself, and how far I’m WILLING to test my limits. Bucket lists, especially those that are public (like this blog), are a great way for one to share their dreams. But not only this. Sharing one’s dreams is to openly acknowledge that you possess the confidence necessary to act upon your words. You open yourself up to potential judgement. You make your failures public. Attempting to make dreams a reality and share them with the world is perhaps the highest form of courage. Candy Chang made this possible for many people in New Orleans. 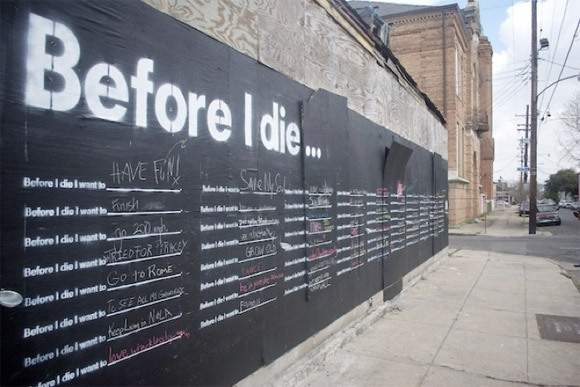 “Installation artist and urban planner, Candy Chang recently inspired New Orleans locals to declare their hopes and dreams on a wall in their community for her new project, Before I Die. This interactive street art uses an abandoned house as a blackboard and encouraged passersby to write down the one thing they want to do before they kick the bucket with the chalk provided. It’s also about turning a neglected space into a constructive one where we can learn the hopes and aspirations of the people around us. Check out more photos of Candy Chang’s New Orleans installation at the Kidrobot blog!